I fell in love with Provence long before I ever set foot on French soil. The lure of Provence from photos and literature caused me to dream for years of visiting this region of La belle France. I almost made it there on my honeymoon when my new husband and I spent a week on the Côte d’Azur. But, I had to wait another 15 years before this travel dream came true. When I finally traveled to this area, I had my two children in tow. I was a bit worried that my expectations were too high and that Provence with kids would be less than ideal. I needn’t have fretted, though, because not only was Provence even more beautiful than I had anticipated, but also it proved to be a wonderful family vacation destination for families. Villas are available for rental throughout Provence. Renting a vacation home is ideal for families who are planning to spend more than a few days in the area and who are happy to get by without hotel amenities. Having a home-away-from-home means having much more space to spread out. Plus, it is often more cost-effective than staying in a hotel. Families will appreciate having separate bedrooms for privacy, a kitchen for meal preparation, and especially a private pool for cooling off after a day of exploring in the heat of a Provençal summer. The most difficult part for me was sorting through all of the choices and deciding which village and which house we wanted to call home for our two-week stay. Explore HomeAway.com to find your perfect Provence vacation home now! Vacationing in Provence provides the perfect opportunity to practice speaking French while being immersed in another culture. Attempting to speak French in shops, at restaurants and with other locals helped my children realize that learning another language is a life skill and not just a subject studied at school in Canada. In Provence, there are fewer people who speak English than in larger cities like Paris so communicating in French is necessary even when it’s a struggle to make yourself understood. By the end of our two weeks, my teen daughter was comfortable ordering from menus and was able to follow simple conversations. Meanwhile, my grade school-aged daughter was quite pleased with her ability to use even a few words. Even if you don’t life in Canada, Provence is the friendliest of French destinations to practice your francais! Kids of any age will enjoy visiting the weekly markets that are held in the villages of Provence. My daughters loved shopping for food—especially bread and fruit. 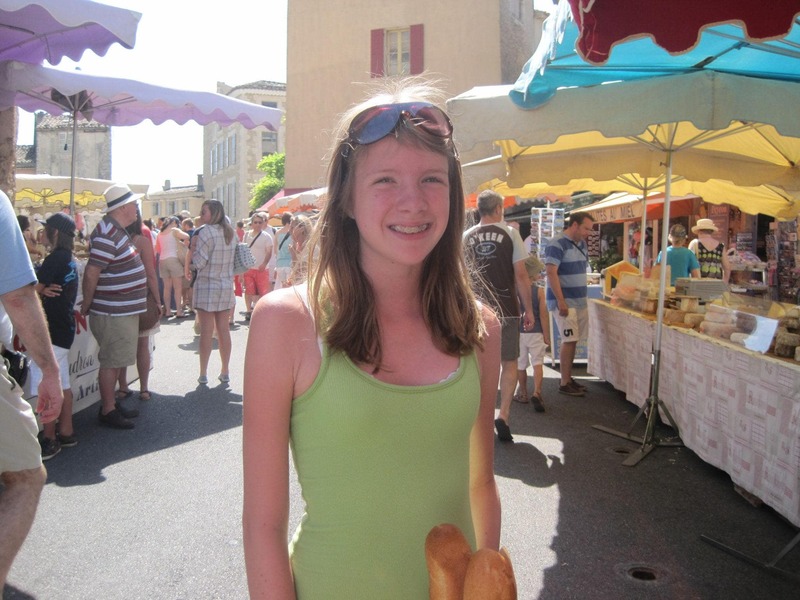 After our trip, we laughed at how many vacation photos included my older daughter with a baguette in hand. She just could not get enough of the delicious freshly-baked bread sold at the markets! Perhaps even more fun was browsing the various stalls for little things like hair-bands and other trinkets. 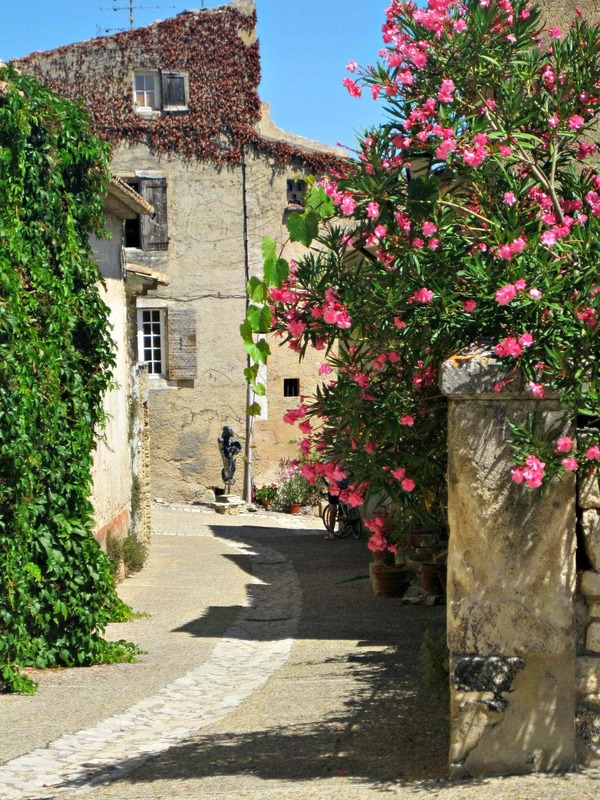 Provence’s picture-perfect villages are great fun for families to explore. Each offers their own unique shops, cafés, and patisseries. We alternated days spent close to our temporary home in the village of Gordes with longer day trips to other areas. We enjoyed the nearby villages of Joucas, Roussillon, Fontaine-de-Vaucluse, Oppède-le-Vieux, Ménerbes, and Lacoste. Every village was just a little different from the others. Meanwhile larger towns had more sightseeing options. 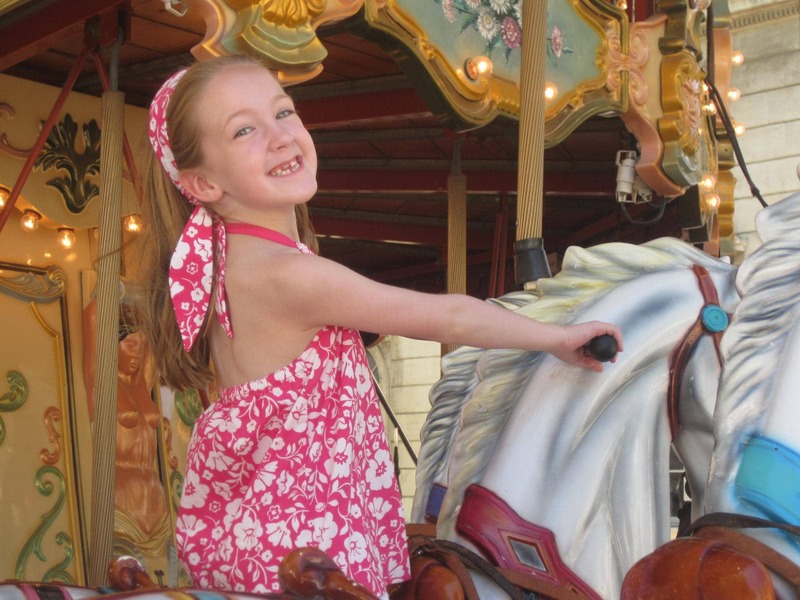 Many featured old-fashioned carousels, which delighted my younger daughter. 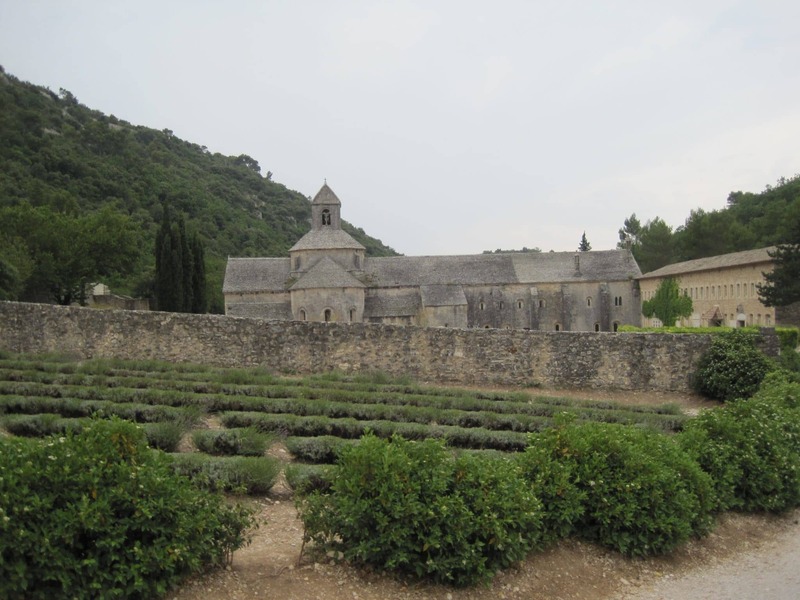 The Abbaye de Senanque and its famed fields of lavender was also nearby. The lavender had bloomed earlier than usual the summer we visited so I will have to return another year to see it. My daughters were content to spend part of each day exploring before returning to our villa for an afternoon swim. Then our family enjoyed leisurely dinners at the restaurants in the village. It was one of the most laid-back, pleasant holidays we have ever taken as a family. Before planning our trip, I had no idea that there was such a Roman influence in Provence. My family visited the Roman Theatre in Orange, and a Roman Arena and Theatre in Arles. 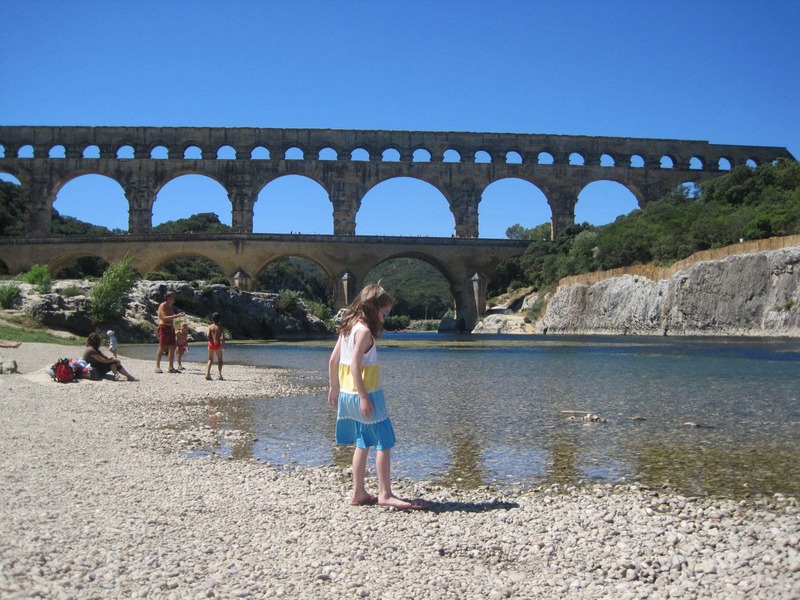 We also explored the Pont du Gard. This Roman aqueduct was built around 19 B.C. to supply water to one of ancient Europe’s largest cities. My kids had so much fun exploring each of these sites that they didn’t realize that they were learning history. In the walled historic area of the city of Avignon we toured the Palais des Papes (or Palace of the Popes), a 14th century Gothic palace that functioned as the primary papal residence and headquarters of Catholicism during the 1300s. In addition to learning about this unique era in the history of the Catholic Church, we also got a chance to dance on the medieval Pont d’Avignon (actually Pont St. Bénezet). Book a tour of these incredible sites in Aix-en-Provence now! Art enthusiasts will appreciate the opportunity to learn more about the many French impressionists who made their homes here during a trip to Provence with kids. In Arles, for example, visitors can not only dine at the famed Café Van Gogh from Café Terrasse at Night, but also they will find easels around town depicting the masterpieces that Van Gogh created on the spot where he painted them. 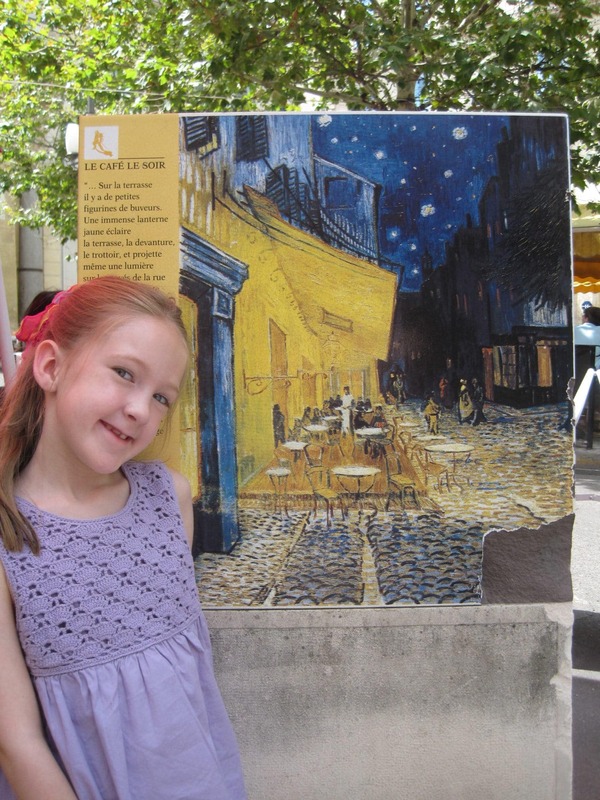 At the time of our trip, Van Gogh was my younger daughter’s favorite artist so she thoroughly enjoyed trekking around Arles in search of the easels and learning. Your vacation in Provence will pass very quickly and, if your family is anything like ours, then you will wish you could do as Peter Mayle did and spend A Year in Provence instead of just a week or two. What do you think your family would enjoy most about a holiday in Provence? Let us know in the comments! I LOVED Provence…it was one of my all time favorite trips. I am happy to hear that it sounds like Provence will be as rewarding a destination with children as it was before. I love the idea of renting a house…it sounds like a such a relaxed way to see things and I think we will be doing a lot more travel in this style once our first child is born in August. Congratulations, Shanna!! Don’t worry about traveling with kids – it can definitely be done! I think that you can take kids anywhere that you want to go so long as you slow down and find a few kid-friendly things to do along the way. And kid-friendly doesn’t have to mean amusement parks – it can be as simple as having a picnic in a park or pausing to ride a carousel in a European village. Best of luck! 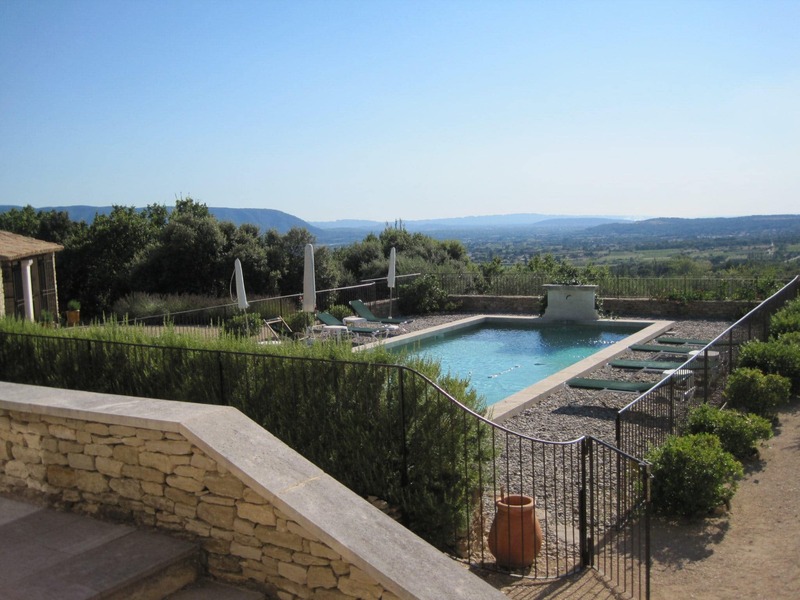 Please let us know what sites you looked into to find the rental in Gordes. Would you recommend a place in Arles? Ellen, we found the villa that we rented on Home Away. The couple that we rented from lived in Michigan and I was able to speak to them on the phone before we agreed to the rental which made me feel that much more comfortable as it was our first experience renting a private home. They employed a local property manager who met us upon arrival and helped with anything that we needed. Arles is very nice but it is a city with a population of somewhere around 50,000 I believe. I prefer the smaller villages but that is really a matter of personal opinion. Hello- I live in New York and will be visiting Provence at the end of August for a week with my 2 young kids. Could you recommend the villa you stayed in please? The villa that we stayed in was called Chemin des Reves and it was located just outside the hilltop village of Gordes. There are a couple of photos of it on the original article that I wrote on my website shortly after our trip. My daughters still say that this was one of the best vacations they have ever been on and it has been 8 years since we visited – they loved the villa! We rented the villa via HomeAway but I believe that it was also listed on VRBO and on the property manager’s website. If you scroll through the reviews on HomeAway you will also find the review that I wrote after our visit. You should check availability as soon as possible because summer months are the most popular – we booked several months ahead of our trip. He really only wants to see the Mona Lisa and the Eiffel Tower, so I’m hoping that’s a short enough list that we won’t have to spend the whole day in lines. I will check out your museums post, too in case we do end up with some extra time! 🙂 Thank you! Steph – my younger daughter was 8 when we visited last year and the Mona Lisa and the Eiffel Tower were her top priorities as well. 🙂 I was afraid that she would be disappointed by the Mona Lisa but she was thrilled. I wrote a post on my site about how excited that Emma was to come face-to-face with the Mona Lisa – it was such an exciting moment for her! Be sure to get to the Eiffel Tower first thing – my teenager slept in and we waited for a couple of hours in line as a result!! Good to know! I am still researching whether to find an English-speaking walking tour or just buy the tickets myself and do this on our own. We don’t know any French and some inside intel is always fun. Did you buy your Louvre and Eiffel Tower tickets in advance? What a great post and a nice visit back to Provence, it has been awhile for me and it was nice revisiting some of these attractions and what a great way to do it by staying in a home rental, great idea. Thank you, Noel! We love staying in home rentals – so much more relaxed than when we are tripping over each other in a small hotel room. Great photos and I hope one day to take my family to Provence! Looks so nice. Thank you, Kiera! Provence is a very family-friendly destination (especially if you rent a home) – I’m sure that you would love it! Looks like fun! We are heading to France again with the boys in July- never thought of adding Provence. Thanks for the ideas! Farrah, you should definitely consider Provence – I imagine that you could get your boys excited about all the Roman ruins and you would love everything about it! I lived in Valence and Chalon-sur-Saone near Lyon. I dream of taking my family back there when they’re a bit older! And I dream of living in France some day – that must have been a wonderful experience! Hi Adam, we rented a villa in Gordes from an American couple via HomeAway – it was the ideal location for us to explore the area. We were there for 2 weeks and rented a car while we were there so we could do some day trips to explore the region. We visited Arles, Avignon, Orange, Aix-en-Provence and even travelled as far as the Cote d’Azur one day. Provence is a beautiful region of France – I’m sure you and your wife will have a wonderful time! 2) The OK Coral park (off the autoroute that goes to Martiges) is quite good for the price. The attractions give enough of a thrill. 4) The Maze near Malmort is OK.
5) The big caves up in the Gard (take in Pont du Gard at the same time), Grotte du Salamander, are impressive. 6) For beaches the Carmargue is the best. Sand and plenty of parking (unlike anywhere on the Cote d’Azur. Saintes Marie de la Mer is the place to go there. Climb on the church roof, take in the bull run, or some French bull fighting (the bull is not killed, but the men stand a very good chance of being maimed! ), and the Spanish vibe (a lot of Spaniards moved to the Carmargue to look after the bulls and it has a Spanish feel to the place), go horse riding (avoid sunset, the mosquitoes will eat you alive). 7) And if you are there in winter, get some skiing in! So thats about it for kids, it really isnt that great. Thank you for the tips, Matt! I assume you’re joking that Provence isn’t that great for kids?! Oh, I forgot Fontaine de Vaucluse, deffinitely do the Kayacking there, Kayack Vert is the better of the two, and go down the river to Isle sur la Sorgue, Very nice when its hot! Fontaine also has caves, an old paper mill, and a good museum to the war. A lot of people think its a bit tacky and touristy, but ignore them and go, its a rich place for tourist activities. Ooh! I’d love to kayak down the river to Isle sur la Sorgue! What dates did you travel? We are going in the 3rd week of July and hope to see lavender in bloom. Hi Ryan – Lavender blooms in Provence from May or June to July or August. I went one year in August and our tour guide was certain there would be no lavender still growing in the fields but we lucked out and were able to see (and smell!) the beautiful purple blooms. Hi Ryan – it’s one of those things that isn’t entirely predictable. We arrived in Provence for our two week vacation on July 31st. The lavender had bloomed early that year and had already been harvested so we missed seeing it. I intend to go back someday to see the blooms!! What village did you stay in? Did you fly to France and then take a train? I am going with my 8 year old daughter, my mom and my aunt in July toLondon and Paris and we are wanting to spend some time in Provence. I’m not sure if we will go Paris train to Provence then take a train to London, or london train to paris train to Provence… but I don’t want us to backtrack all the way to paris to fly home. What did you find the easiest way to reach provence? We rented a villa that was just outside the village of Gordes – it was very central for visiting most places in Provence. We were in Provence the entire two weeks of our vacation. We flew to Marseilles via Munich from Toronto and rented a car in Marseilles to drive to Gordes. I believe it took about an hour and a half or so to drive to Gordes from the Marseilles airport. Perhaps you could fly to London, train to Paris, train to Provence and then fly home from Marseilles. J’adore! Provence is my favorite all time destination. We go there every summer to enjoy the warm climate, sunny days, lavender & fields full of sunflowers. Our fovorite region is the Vaucluse and the Luberon with magical towns like Lourmarin and L’Isle sur la Sorgue. Rent a holidayhome with a pool and your perfect vacation can start 🙂 Love it!! It’s hard not to love Provence! I’m from México. I’m planning to spend a week (7-8 days) in the South of France with my husband and my kids (4 and 2 years old) in mid August. I was thinking in starting in Montpellier and end up in Nice. Probably spend a night in saint tropez as well. What would you recommend to visit in the middle and where to stay? ?